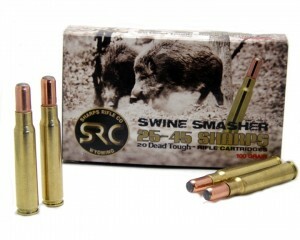 The new 25-45 Sharps Swine Smasher 100 grain ammo is now available from the Sharps Rifle Company. This new ammo brings a much heavier bullet, which equates to more foot-pounds of energy. 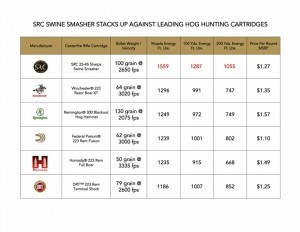 SRC has specifically developed this round for the hog hunting community. Check out more information over on the SRC Arms website. 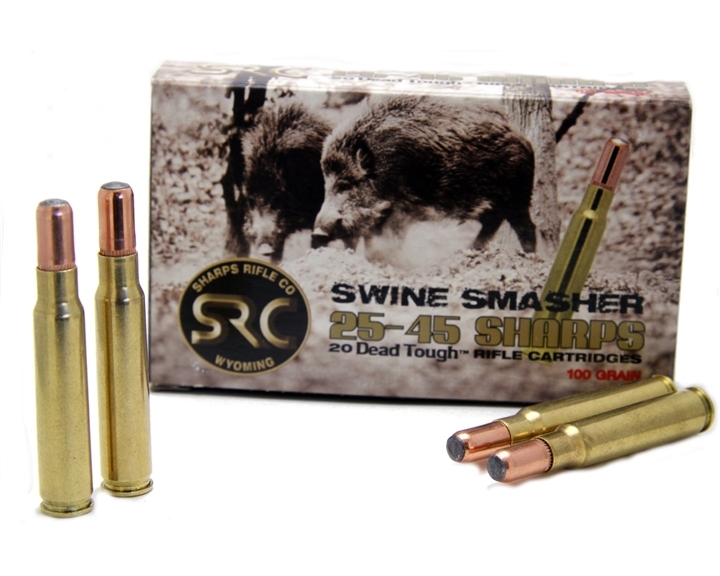 The Sharps Swine Smasher, a revolutionary new hog dedicated load that will change the way your AR platform rifle brings home the bacon! 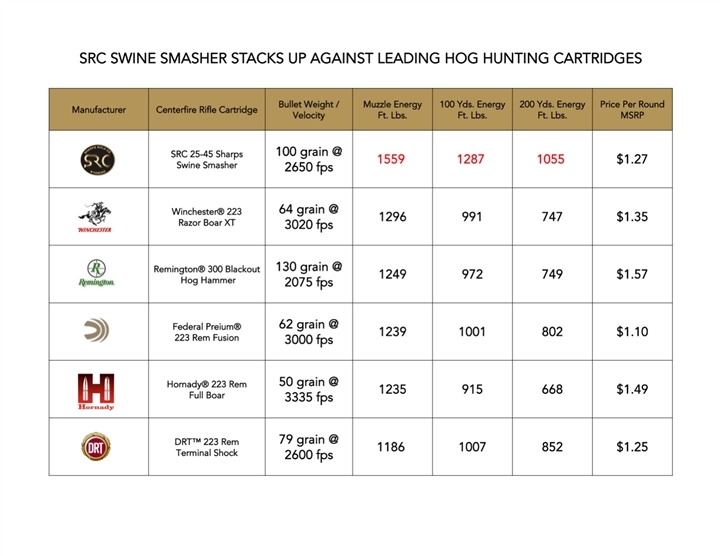 Beginning with the powerful 25-45 Sharps cartridge, we’ve developed a hog specific projectile using technology primarily reserved for the Safari market. This 100 grain Dead Tough™ bonded core beauty incorporates controlled expansion and straight line penetration to provide quick humane kills on the biggest, nastiest hogs you can find. Utilizing the time proven energy transfer provided by the increased striking surface area of a round nose Dead Tough™ bullet you will clearly experience the difference in stopping power in the field. You can easily convert your standard AR platform rifle to the more powerful 25-45 Sharps cartridge with a simple SRC barrel replacement, while still utilizing your standard 5.56mm / 223 Rem. bolt face and magazines.Or you can enjoy the benefits of the 25-45 Sharps significantly increased power by simply purchasing a complete upper or complete rifle package from SRC. Please be aware that the PMAG or magazines with bullet separating ridge WILL NOT work with the SWINE SMASHER round nose cartridge. Only the square front style magazines will accommodate the ammo.